Wheelersburg’s Sydney Salyers fields a ball during pregame warmups. Wheelersburg’s Catie Boggs throws a ball from her shortstop position in pregame warmups. Wheelersburg’s AndiJo Howard struck out 11 batters and only gave up two hits in all to record yet another fantastic performance on the mound. Wheelersburg’s Ashlee Spence turns on a pitch. Wheelersburg’s Jaelen Thomas swings at a pitch. WEST PORTSMOUTH — Something is in the water in Wheelersburg. 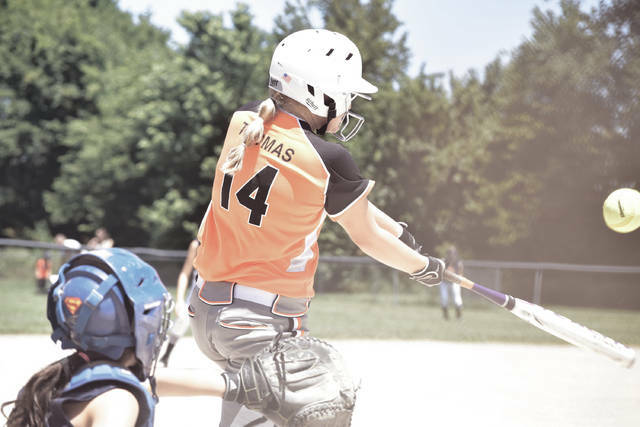 Whether it’s a clutch at-bat, a clutch pitch, or a clutch defensive play in the field, it just seems like the units that the community puts together always find a way to emerge victorious. 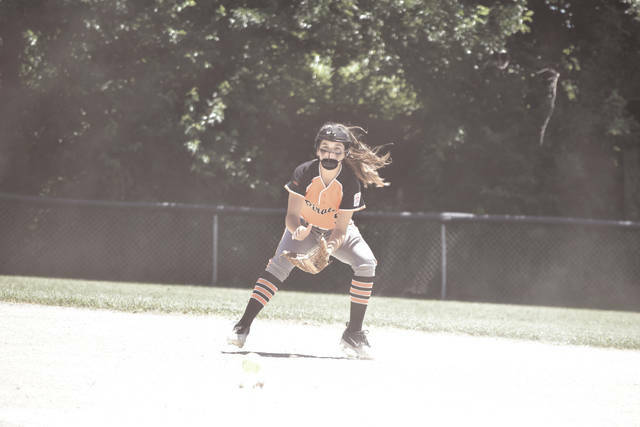 And on Saturday afternoon, the Wheelersburg 11-12 year-old softball All-Stars came up big in the clutch to continue the winning tradition of their community alive in grand fashion. With AndiJo Howard putting in ultimate work on the mound — as evidenced by a masterful two-hitter that came via an 11-strikeout performance — the 11-12s were able to dovetail the efforts of their outstanding pitching hand with a run of their own as a leadoff walk in the bottom of the sixth by Sydney Skiver, a double by Maddi Kotcamp, and an intentional walk to Haley Myers set the table for Catie Boggs — who came to the plate with the bases loaded and two outs — to come through as the possible hero. Not phased by the pressure that awaited her in the biggest at-bat of her softball life, Boggs, on a 3-1 count, patiently took ball four high and away to score Emma Smith, who courtesy ran for Skiver, as the Lady Pirates took home a 1-0 victory over the Tallmadge 11-12 All-Stars on Saturday afternoon in the Ohio 12U Softball State Tournament’s Opening Round at Doc Singleton Park in West Portsmouth. While the finish was of hectic proportions, and certainly one that was of the exciting variety, it didn’t come as a surprise to Dusty Salyers or many of the fans in attendance who have followed both teams for years now. The same exact qualities, however, could be said about Wheelersburg. 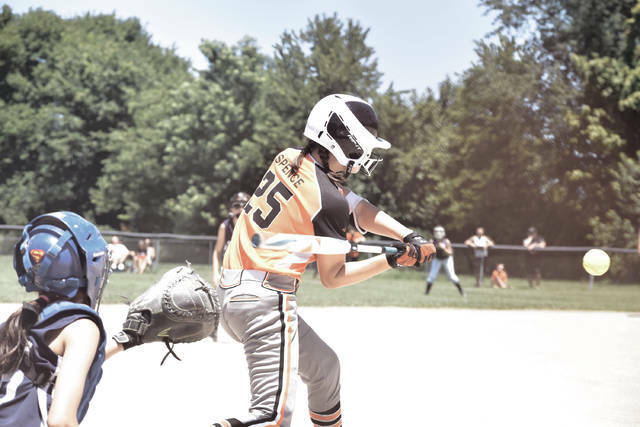 Throughout the course of the six-inning affair, the 11-12s didn’t give up a single legitimate base hit as the two hits that Howard gave up were on well-placed bunt singles by Sydney Becks in the top of the third frame and Emma Garbinsky in the top half of the fourth frame. Otherwise, Howard, who had seven strikeouts through four innings of work, proved to be untouchable as the standout southpaw capped off her pitching appearance by striking out the side in order in the sixth frame of action to keep the score locked at a 0-0 tie. And even on the two recorded hits by Tallmadge, Wheelersburg never flinched. When Becks reached to begin the third inning, the third baseman, who attempted to steal second base, was gunned down on a fantastic throw by Maddie Kotcamp, who made the throw look as if it was all in another day’s work. The Lady Pirates didn’t commit a single error in eight defensive chances. Tallmadge’s defense, however, also proved to be very stout. In the fourth inning of play, a leadoff walk by Skiver was followed by a bloop single from Howard that landed inside the third base line, and when Skiver beat out the ensuing throw to third base, Howard glided into second base standing up. An fielding error in the infield allowed the Lady Pirates to load the bases with nobody out. However, in a display of incredible poise, the Lady Devils rose to the tough challenge ahead of it. Haley Myers launched a well-hit fly ball to center field for what seemingly looked to be a sure sacrifice fly, but a strong throw home by Lauren Teeling forced Skiver to stop and scamper back to the third base bag. 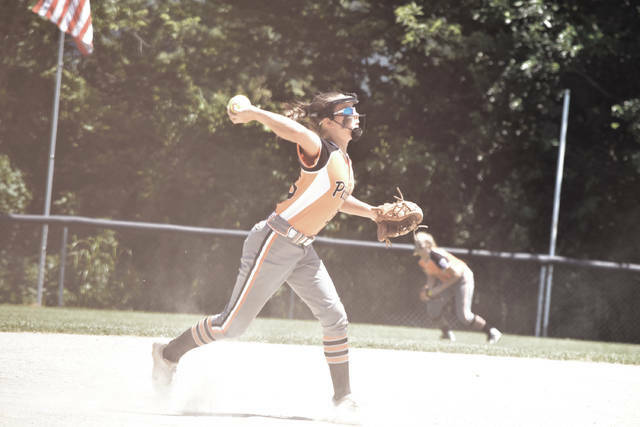 An excellent backhanded play by Ashlyn Severns at second base and a well-fielded 1-3 putout by Mia Zappola — who only allowed five hits herself — kept Wheelersburg from tacking on a single run as both teams remained at a 0-0 deadlock after four innings of work. Howard’s pitching performance, however, would allow the ‘Burg 11-12s to garner another chance at striking the scoreboard. Not surprisingly, Skiver, who again led Wheelersburg offensively by going 1-for-1 with two walks at the plate, walked to lead off the bottom half of the frame, and Smith, who came in to courtesy run for Skiver, was moved into scoring position by Howard on a sacrifice bunt to the third base side. When a double by Kotcamp put the standout catcher on second and Smith at third base, Tallmadge, knowing that they needed an opportunity to have a force at any base, walked Myers intentionally to load the bases. Thomas nearly made the Lady Devils pay dearly for that idea as the sound first baseman lined a well-hit shot to right field on a 3-1 count, but Ella Bee, who saw the ball from the moment it left Thomas’ bat, tracked it down in right to put Boggs in a tough spot. The multi-sport student-athlete, however, didn’t flinch under pressure, and on a similar 3-1 count, drew the base on ball that would drive Smith in for the game-winning run. With the victory, Wheelersburg will play Canfield in the winner’s bracket of the Little League Major Division State Softball Tournament. The winner of the contest, which will be played at 11 a.m. Sunday morning, moves to Monday’s championship round, while the loser will have to play again at 3 p.m. Sunday afternoon in what will serve as a go-or-go-home contest. https://www.portsmouth-dailytimes.com/wp-content/uploads/sites/28/2018/07/web1_DSC_1005JPG_cmyk-1.jpgWheelersburg’s Sydney Salyers fields a ball during pregame warmups. https://www.portsmouth-dailytimes.com/wp-content/uploads/sites/28/2018/07/web1_DSC_1001JPG_cmyk-1.jpgWheelersburg’s Catie Boggs throws a ball from her shortstop position in pregame warmups. https://www.portsmouth-dailytimes.com/wp-content/uploads/sites/28/2018/07/web1_DSC_0006JPG_cmyk-1.jpgWheelersburg’s AndiJo Howard struck out 11 batters and only gave up two hits in all to record yet another fantastic performance on the mound. 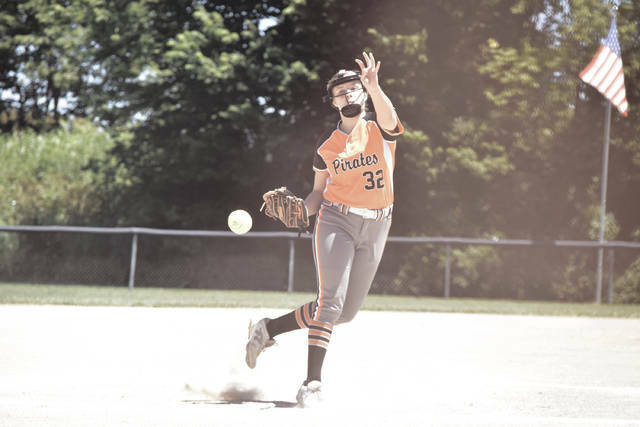 https://www.portsmouth-dailytimes.com/wp-content/uploads/sites/28/2018/07/web1_DSC_0055JPG_cmyk-1.jpgWheelersburg’s Ashlee Spence turns on a pitch. https://www.portsmouth-dailytimes.com/wp-content/uploads/sites/28/2018/07/web1_DSC_0051JPG_cmyk-1.jpgWheelersburg’s Jaelen Thomas swings at a pitch.